To date we know that Samsung is still hesitating about the choice of taking an architecture dual-core or quad-core to its future Galaxy S3. Samsung has announced the successor to its current Exynos with a new version etched finer, better GPU and a CPU speed higher. However, nothing prevents Samsung to work on other architectures. The one that interests us here, a racing machine with very low consumption. This would be based on a multiple processor cores in ARM Cortex-A15 (successor to the A9 ) coupled to other hearts Cortex-A7. 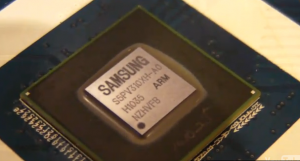 The ARM Cortex-A7, what is it? One might, for example two cores A7 which would deal with trivial tasks in the background as the various push and refresh application connected to the Internet (weather, Twitter, Facebook, Gmail, etc.).. Then next 4 cores A15, which would serve them with heavy tasks like browsing internet gaming, HD video, etc.. It remains to know the expected graphics processors, whether or not Samsung will continue with ARM and the next generation of MALI, or the Korean giant will return to ITech PowerVR and ARM deemed best GPU on the market.